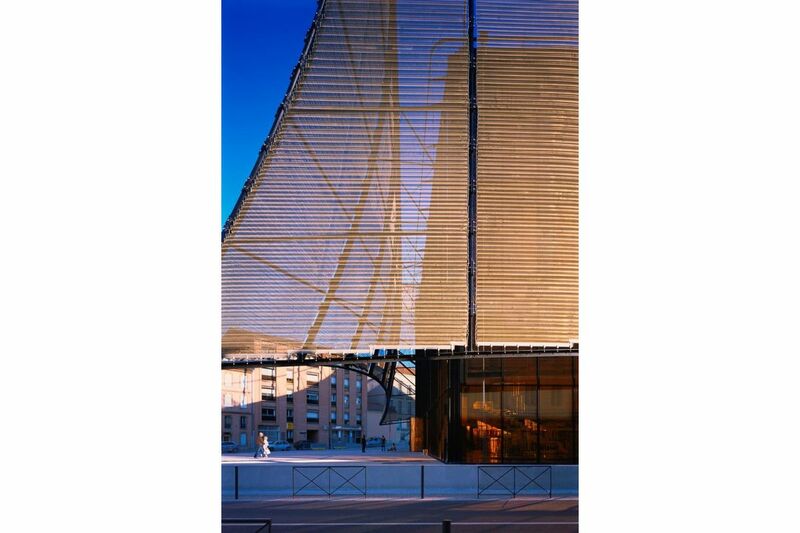 "Curtain Call: A simple box, dressed up with a curving metal screen, gives an ancient city a modern monument." 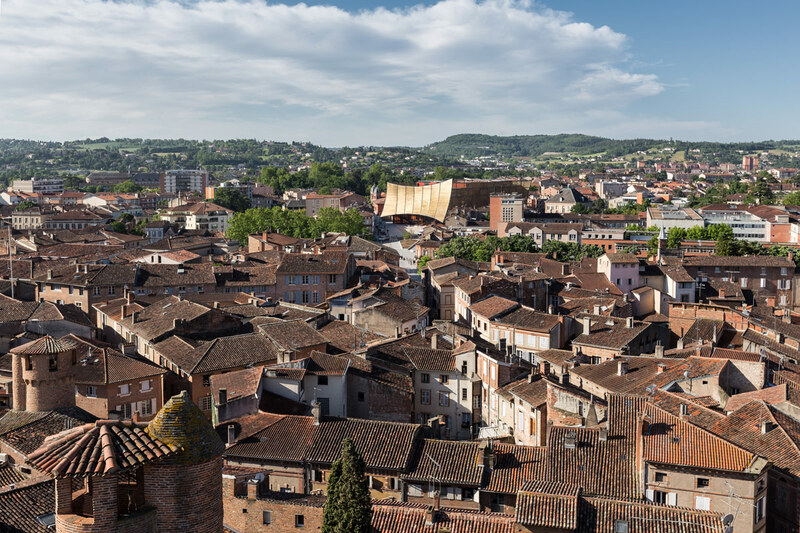 "For more than a thousand years, the building material of choice in Albi, a small city on the Tarn River in southern France, has been a pinkish Languedoc brick. Even the imposing 13th-century cathedral there, with its gigantic nave and 250- foot-tall bell tower, was built from the distinctive masonry, giving it an appearance that’s more fortress than church. 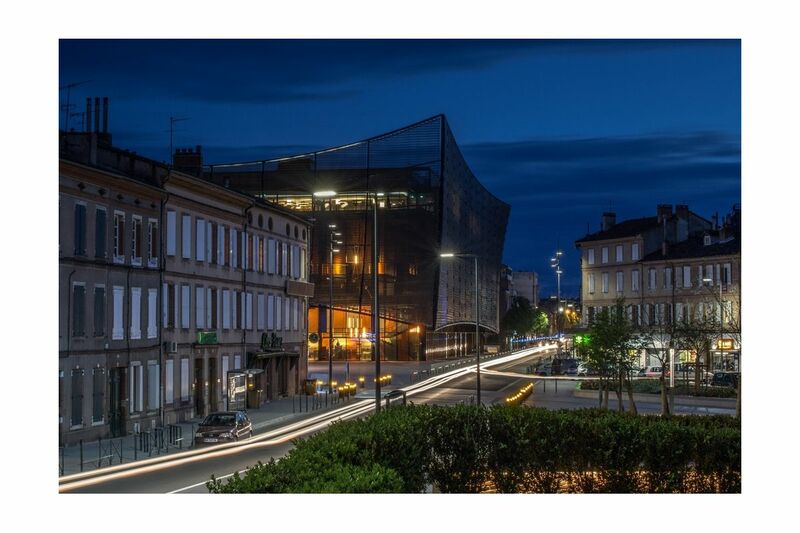 But just beyond Albi’s historic quarter, a new building by Paris-based Dominique Perrault Architecture defies the city’s traditional heft. 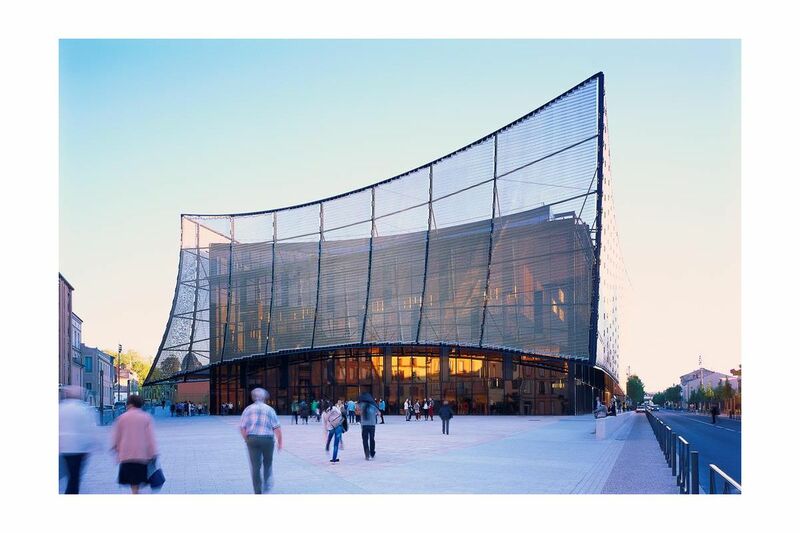 The Albi Grand Theater, a simple box that the architects have wrapped with a curving metal screen, appears to float over a plaza. 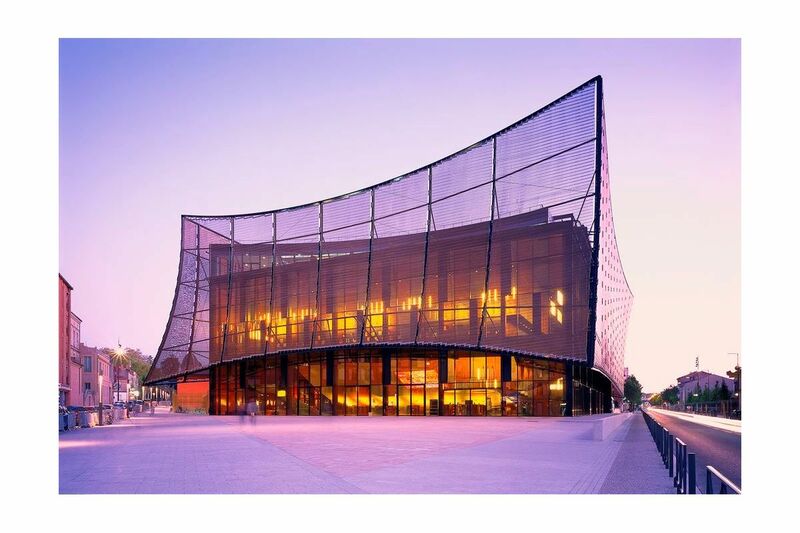 The scrim’s four sides, which measure 38 feet at their tallest, look like stretched lengths of fabric suspended over each of the building’s elevations. As you emerge from the old city’s warren of crooked Medieval streets, the curtain-like form comes into view with a surprising weightlessness. The building’s lightness is all the more striking, given how much the designers had to fit onto the site. The Scène Nationale d’Albi never had a permanent home. For decades, it hosted performances at a group of small theaters around the town of just over 50,000 people. But five years ago, city officials decided to construct a purpose-built facility for the organization, along with a commercial cineplex—and ample public parking—in what they envisioned as a new cultural complex. Dominque Perrault beat out Kengo Kuma and Christian de Portzamparc in an invitational competition for the commission. 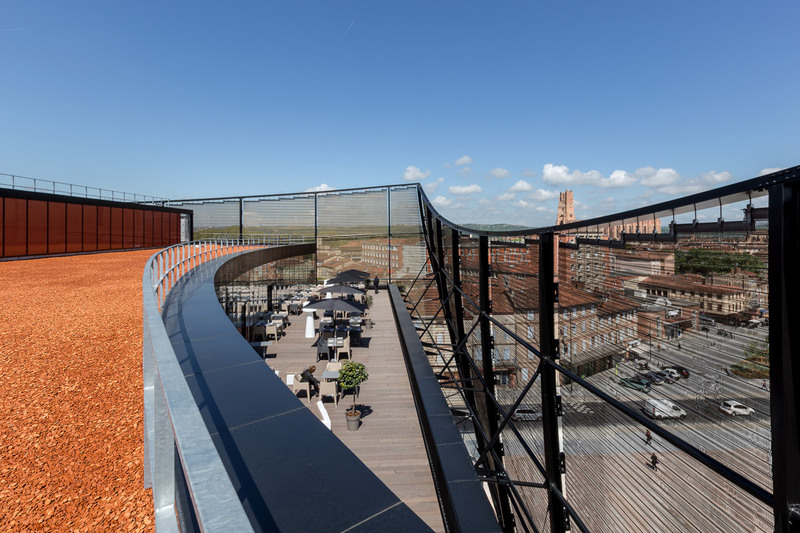 The firm’s design adeptly organizes the program and, in a city without much showpiece contemporary architecture, it ends up being unexpectedly harmonious with its historic neighbors. The architects strove to keep the project from overwhelming the site, a 2.5-acre triangle that housed surface parking next to a 19th-century convent-turned-theater and an unremarkable two-story brick building from the 1980s. They buried a three-level garage and 10 movie theaters below grade and converted the 1980s building, which the city wanted to preserve, into an aboveground lobby for the cineplex (the operator has decorated it with typical popcorn kitsch). For the building housing the performance hall, the architects replaced the surface parking with a five-story, 101,000 square-foot concrete structure. 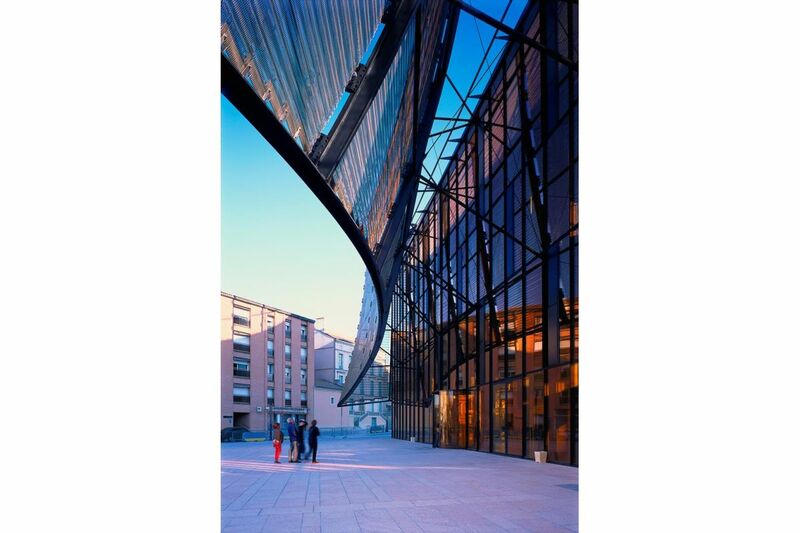 They placed a 900-seat auditorium in the center of the volume and flowed everything else—including a lobby, a black-box performance space, and offices for the Scène Nationale—around it, capping it with a rooftop restaurant. Packing the building tightly allowed the architects to reserve the rest of the former parking lot for two public plazas—though connection between one of them and a newly pedestrianized street is marred by the cinema’s fire stair rising from below. 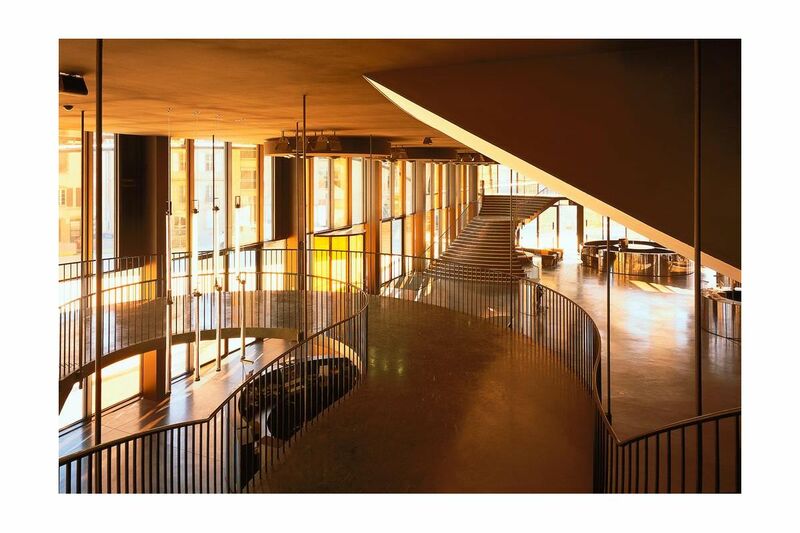 That dynamism continues inside, where all of the interior spaces seem to shift and bleed together. 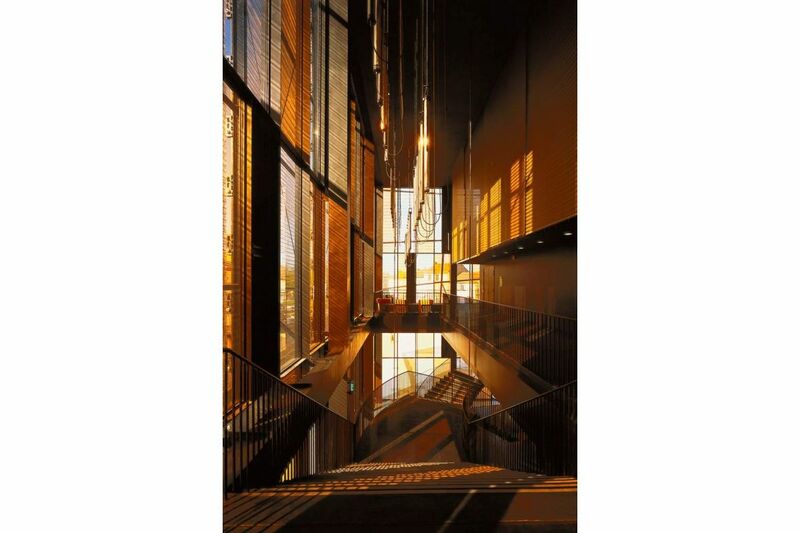 The volume of the main performance hall protrudes into the lobby like the prow of a ship breaching a wall. Black-stained oak floors, black-painted walls, and stage lights in the public spaces blur the line between backstage and front-of-house. 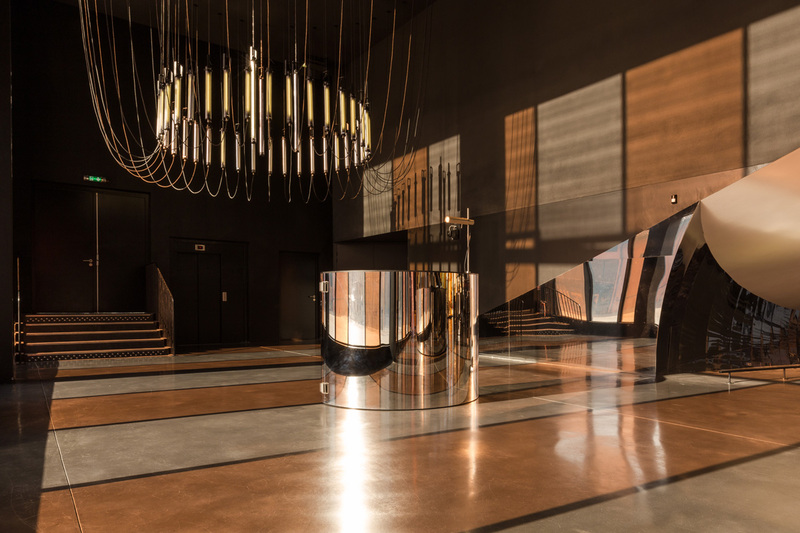 Inside the main hall, the designers pair a prim minimalism with references to Albi’s historic architecture. 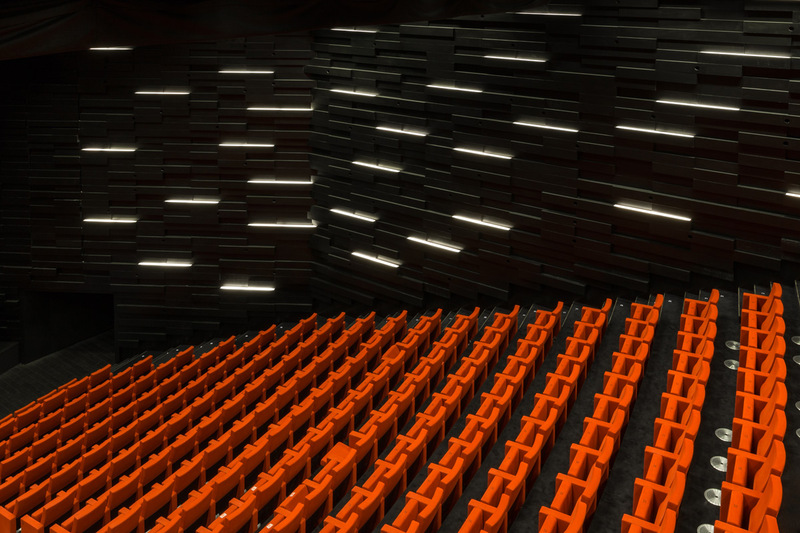 The walls, designed with acoustician Jean-Paul Lamoureux, are covered in black wooden “bricks,” some solid and others hollow, which project and recede to conceal lighting and to temper sound in the auditorium. 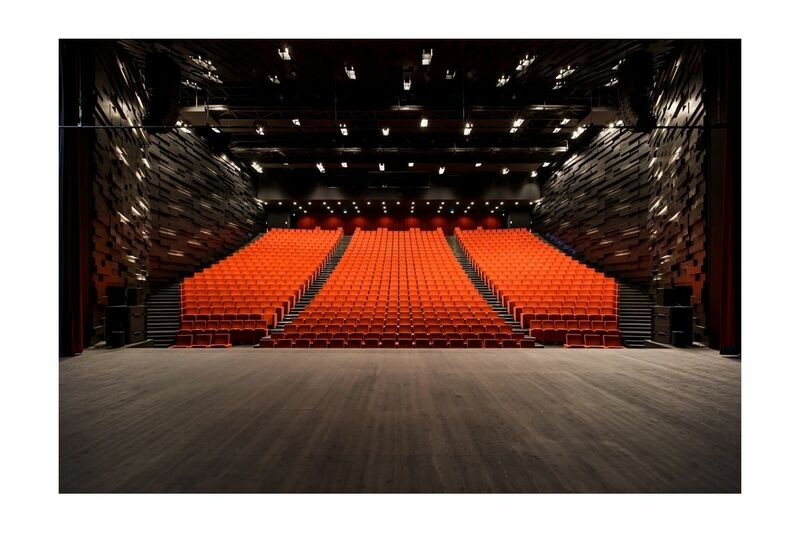 The theater accommodates touring performances, from drama to dance to contemporary circus, on a scale impossible before the space was built; the 2014 season has seen attendance rise by 50 percent over previous years. 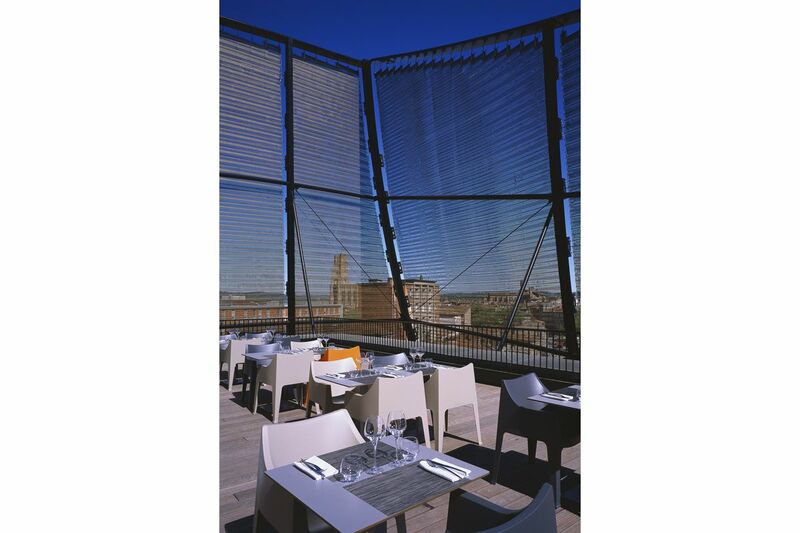 If Albi’s imposing brick cathedral represents the city’s heritage, Perrault’s shimmering scarf gives it an emblem for its contemporary cultural life. 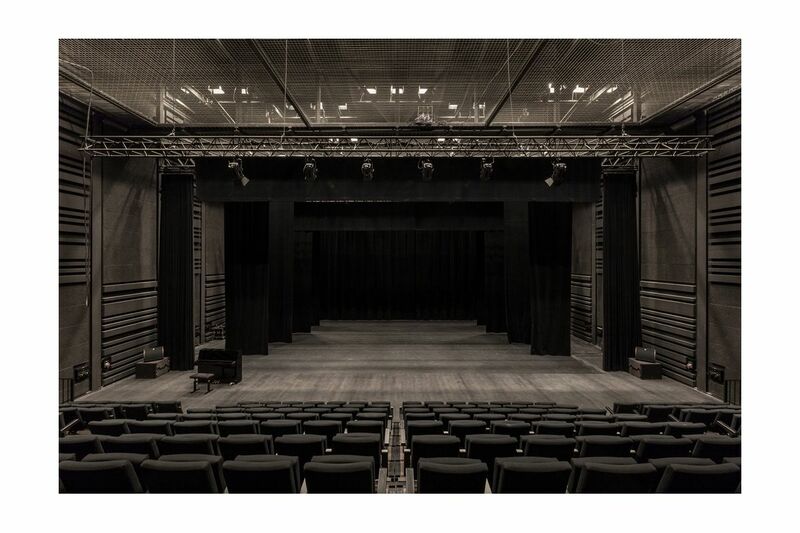 The theater is an unapologetically alien presence, but it’s also a sensitive foil for the old brick structures, and a new kind of monument for the city."